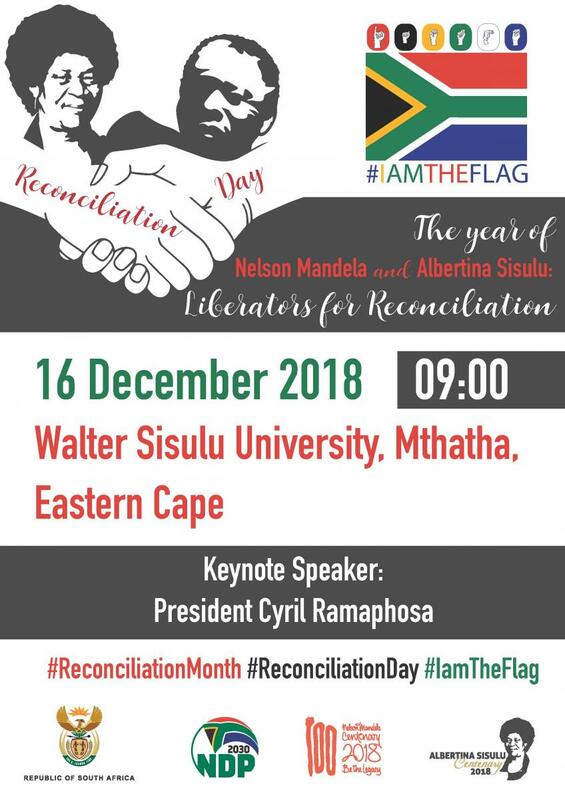 This year Reconciliation Month will be celebrated under the theme: “The year of Nelson Mandela and Albertina Sisulu: Liberators for reconciliation”. The month is aligned to the centenary celebrations of struggle stalwarts Nelson Mandela and Albertina Sisulu. These two liberation heroes were at the heart of driving our national reconciliation project. In marking Reconciliation Month we can honour our struggle icons by reaching out to each other to foster a more cohesive society. We can also advance our national reconciliation project by exhibiting the values of these two icons. National Reconciliation Day on the 16 December came into effect in 1994 and was intended to help build a united and prosperous South Africa. The Government of National Unity identified a day which would be dedicated to this ideal. Despite positive strides since 1994, the recent incidents of racism show that South African society remains divided. The privilege attached to race, class, space and gender has not yet been fully reversed. Reconciliation Month is therefore of even greater importance today as we strive to build cohesive society. Social cohesion is one of the priorities outlined in the National Development Plan and Government’s Medium-term Strategic Framework 2014 - 2019.